This excellent green Pu-erh brick was first produced in Yunnan tea factory in 2005, prepared with extra care by using leaves from the improved large leaf tea species and it belongs to the series of top grade compressed Pu-erh tea. 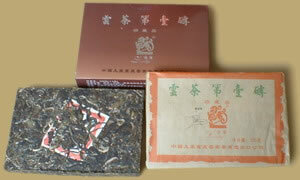 The tea is of a square shaped mass of leaves, with shinny luster and strong scent. It's liquor looks bright yellow, taste refreshing and sweet in aftertaste. Perfectly drinkable now but great potential after a few years of aging.